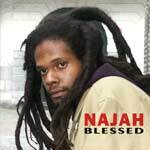 Najah’s album "Blessed" is just that, a blessed collection of songs showcasing Najah’s strong lyrical and vocal abilities. This is roots reggae music to keep your meditation clean, to keep your focus on the Most High, Haile Selassie I the First, and to uplift your soul outta di babylon confusion. Hailing from the Island of Saint Martin, (part of the Netherlands Antilles Islands), born Gianni Lucini McDowall, Najah exemplifies consciousness through his Rastafarian culture. The sound is pure and fresh, and his voice commands the listeners full attention. If you are a collector of serious, Rastafari inspired roots reggae, then this cd definitely belongs in your musical library.